Retractable cradle rotates full 360º. 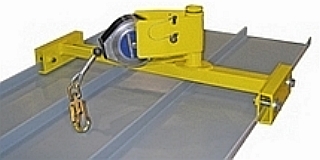 Accommodates most 30-50 foot retractables (retractable and harness not included). Supports 1 worker (up to 310 lb) in fall restraint. Guardian #10915 30-foot x 3/16 inch Galvanized Cable Retractable Lanyard, with Swivel Top, Snap Hook, Carabiner & Tag Line. Price/Each. Guardian #00610 Weld-on Steel Application Roof Safety Anchor. Forged steel D-ring 2 1/2 inch diameter. Price/Each.